‘Mickey in Arabia’ can be described as ‘Gallopin’ Gaucho‘ in Arabia. In this short Mickey and Minnie are tourists visiting some mythical Arabian country on a camel. Here they meet Pete, who has both his legs here, and who apparently is some sort of sheik. Pete captures Minnie, which leads to an exciting finale, which consists of continuous series of gags. Despite its all too familiar story outline, ‘Mickey in Arabia’ is a major step forward in the Mickey Mouse series. It places Mickey outside his familiar barnyard and performance settings, and sends him on an adventure abroad, similar to the ones Mickey was having in Floyd Gottfredson’s comic strip of the same time. Mickey is at his best as the little hero, and he excels here. 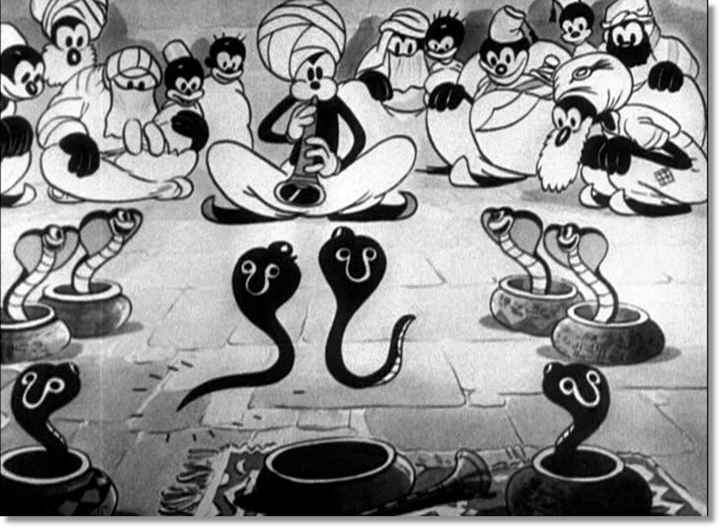 Gottfredson himself sent Mickey to Arabia, too, but only two years later, at the end of 1934. His comic strip ‘The Sacred Jewel’ borrows a lot of images from this 1932 film. The adventure notwithstanding, the Disney story men didn’t forget to fill the short with gags, making ‘Mickey in Arabia’ a fast paced and funny short. It also has a great score, which makes excellent use of Albert Ketèlbey’s ‘In a Persian Market’ to create an Arabian atmosphere. With ‘Mickey in Arabia’, the studio had hit the jackpot storywise, and in the next two years Mickey would play the little hero more often, with delightful results. Indeed, already in the same year, ‘Mickey in Arabia’ would be topped by the even more excellent ‘Touchdown Mickey‘ and ‘The Klondike Kid‘. Zo zie je maar weer: die Arabieren zijn niet te vertrouwen en zwartjes kunnen niet nadenken.